Picture from group : Carrigwadra from the north. Picture: Carrigwadra from the north. Rough, rarely visited but giving interesting perspectives. Carrigwadra, the SE spur of Crohane, can be reached from the informal but traditional parking at W03678454 A which is at the end of an extremely potholed road reached from the N22. Go south along the pilgrims path into the extremely scenic vee between Bennaunmore and Crohane SW to the south end of L. Nabroda. Then go west 2.2km. 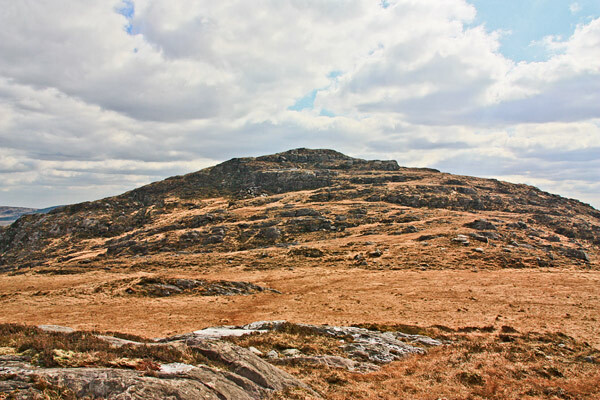 Route finding is difficult in the complex land to the south of Crohane and it may be easiest to climb Crohane SW first. Round trip time using the same route is around 3.5 hours and it is likely to be easiest in dry spring weather when the vegetation is somewhat subdued. It is also possible to reach Carrigwadra from Crohane, for example starting at W 042 851 B. Note that the north and east sides of Carrigwadra have significant cliffs. Further uptodate research will probably also confirm an earlier report that Carrigwadra can be reached from the Loo valley to the south.